A managed process of ICT-enabled change in the public sector, which puts the needs of citizens and businesses at the heart of that process and which achieves significant and transformational impacts on the efficiency and effectiveness of government. This definition deliberately avoids describing some perfect “end-state” for government. That is not the intent of the Transformational Government Framework. All governments are different: the historical, cultural, political, economic, social and demographic context within which each government operates is different, as is the legacy of business processes and technology implementation from which it starts. So the Transformational Government Framework is not a “one-size-fits-all” prescription for what a government should look like in future. Rather, the focus is on the process of transformation: how a government can build a new way of working which enables it rapidly and efficiently to adapt to changing citizen needs and emerging political and market priorities. In the words of one of the earliest governments to commit to a transformational approach: “…. the vision is not just about transforming government through technology. It is also about making government transformational through the use of technology”. · They focus on the "citizen" not the "customer". That is, they seek to engage with citizens as owners of and participants in the creation of public services, not as passive recipients of services. Each of these defining aspects of Transformational Government is explored in more detail below. Most governments are structured around a set of vertically-integrated silos or stovepipes - agencies, departments, ministries. By and large, it is these silos which the Governments of developed countries have spent billions of dollars "e‑enabling" since the 1990s. However, this is an ICT investment strategy which is fundamentally not citizen-focused, because the needs of citizens, businesses and others cut across the organisational structures and hierarchies of government. It has inevitably resulted in low levels of take-up for e‑services. Governments in developed countries are now grappling with the legacy of thousands of fragmented, silo-focused websites: more than 270,000 in the US public sector, 9,000 in Germany, and 3,000 in the UK. An increasing number of governments are now seeking to make a fundamental strategic shift, towards a holistic, citizen-centred approach, driven at the whole-of-government level. 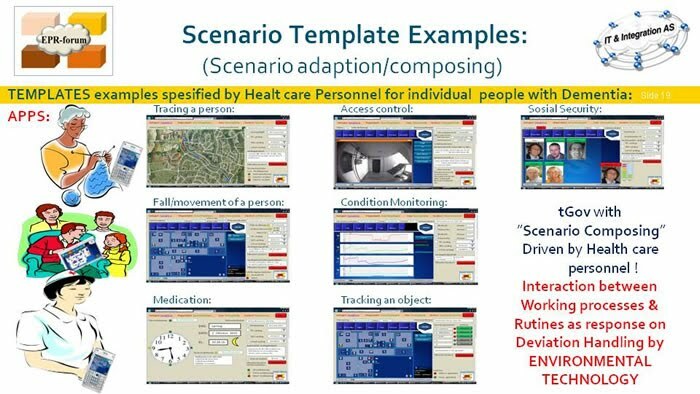 This shift includes, in leading countries, a move to a “one‑stop” citizen-centric service delivered over multiple channels. Traditional e‑Government has focused on e‑enabling transactional services and providing online content. The great majority of public sector staff and expenditure is not however involved in such services, but rather in "front line" delivery: teachers, healthcare workers, police, court officials, emergency response teams, etc. Leading governments are beginning to understand how the work of such front line staff can be transformed through the use of real-time knowledge management and mobile workflow applications. Citizens' experience of new technologies is shaped by the best that the private sector has to offer globally and - increasingly - through the ability to co-create content and services as individuals or in peer-to-peer networks. They will demand ever greater interactivity and ownership in their relationship with public services. Transformational Government programs embrace this. Where traditional e‑Government programs focused on the user as "the customer", Transformational Government enhances the relationship between government and the citizen on a richer, more reciprocated, and more empowering basis. · doing so in ways which not only duplicate expenditure, but which also will not inter-operate with other agencies - making it more difficult and expensive to move towards inter-agency collaboration in future. A key focus of Transformational Government is therefore to move towards a service-oriented and building-block approach to ICT and back-office service architecture across all parts of government - reaping efficiency gains while at the same time enabling better, more citizen-focused service delivery. As “cloud computing” gains traction and momentum, this approach opens up even greater scope to achieve large-scale efficiency savings while simultaneously improving organizational agility. · structures, governance, funding & culture which are all organized around specific business functions, not around meeting citizen needs in a holistic way. In the increasingly common situation of governments being expected to deliver better and more services for less cost whilst maintaining high-level oversight and governance, the Transformational Government Framework provides a framework for designing and delivering an effective program of technology-enabled change at all levels of government. · Service and technology solution providers to the public sector. · Professional bodies that support industry sectors by the development and maintenance of common practices, protocols, processes and standards to facilitate the production and operation of services and systems within the sector, where the sector needs to interact with government processes and systems. · Academic and other researchers working in the field of public sector reform. · Civil society institutions engaged in debate on how technology can better enable service transformation. 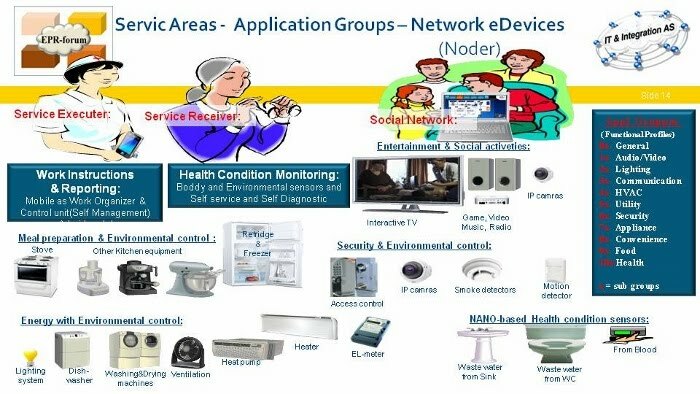 During the last years we have reached a situation where all electrical equipment can be Internet connected (Pervasive computing). This new situation require a more impartial and fair interaction paradigm shift where we go from "Back Office" automation (dominated by lagacy system vendors running on different platforms) to "Front Office" automation (Cloud services and SmartPhone/Tablet applications). This places new demands on how management and specifications for software and equipment are done in the Public sector regarding the legally mandated services! 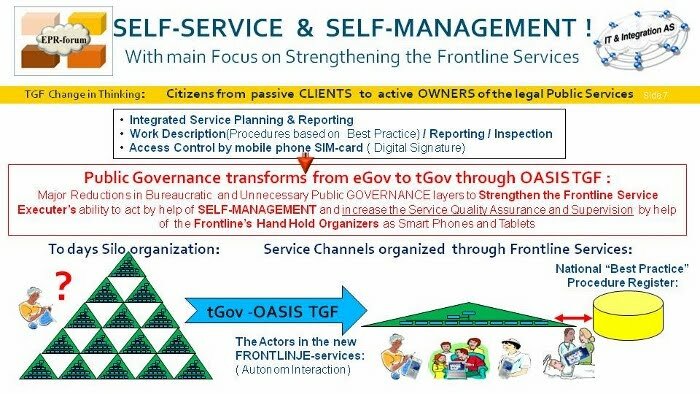 SELF-SERVICE and SELF-MANAGEMENT solutions are taken into a new dimension and calls for a CHANGE OF THINKING that focuses on the Frontline Services and forcing a new organizational structure and culture inside the Public sector. 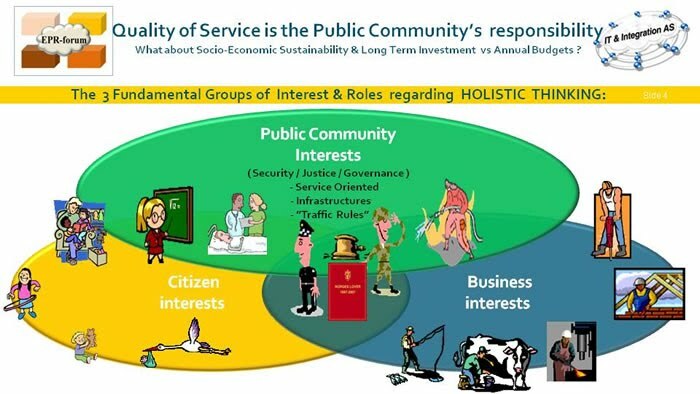 The change of thinking is to let citizens become active and responsible owners of our community rather than passive clients where all needs of services are handled by our Communities (It is not sustainable anymore considering the aging population and the greater demands for services). The Norwegian Interaction reform can be an important "tool" in this needed change of thinking ! 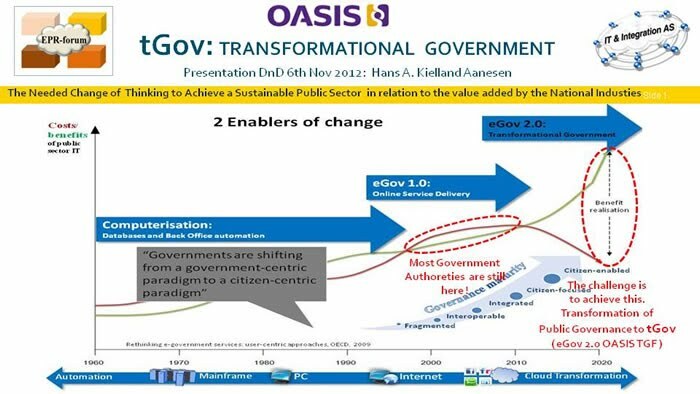 Has over the last decades been working with interoperability, interaction and information exchange standards with the main focus on a Holistic thinking as done in the OASIS Transformational Government Framework (TGF) utilizing the Web 2.0 and Cloud tranformation paradigm. Her we are using eGov 2.0 as a platform to transform the Government (tGov). These contributors represent the new Frontline service and they will use Self-service and Self-Management on a common intercating infrastructure. It is in such interaction relations that the public Government must be responsible in defining and making an "open" infrastructures " with common " traffic rules "that are not locked up to a specific System Supplier. It is important to ensure that the public Government is able to distinguish between the Infrastructure and the implemented Services which sets clear distinction between the Government role and the Business role.